Attention Plant Geeks! You still have time to visit the greatest flower show on earth! 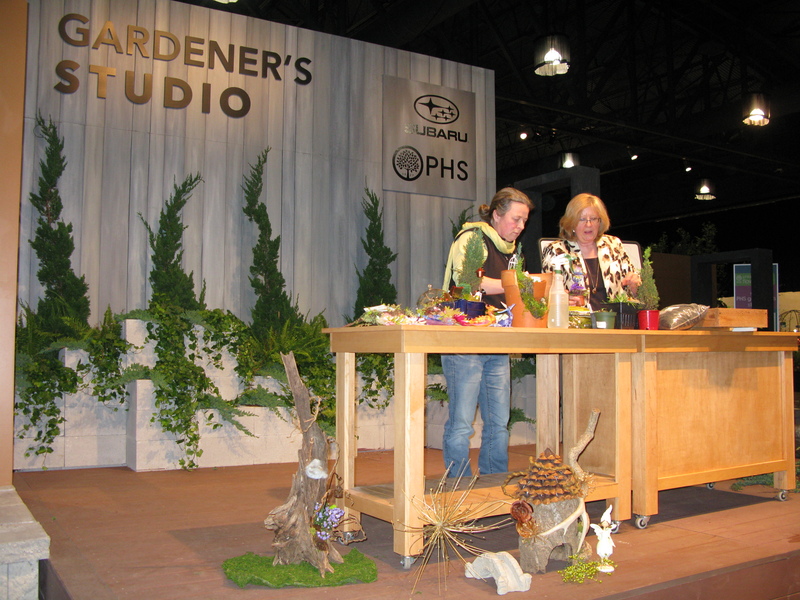 I just came back from doing my demo of fairy gardens at the Philadelphia Flower Show and took lots of pictures and video. 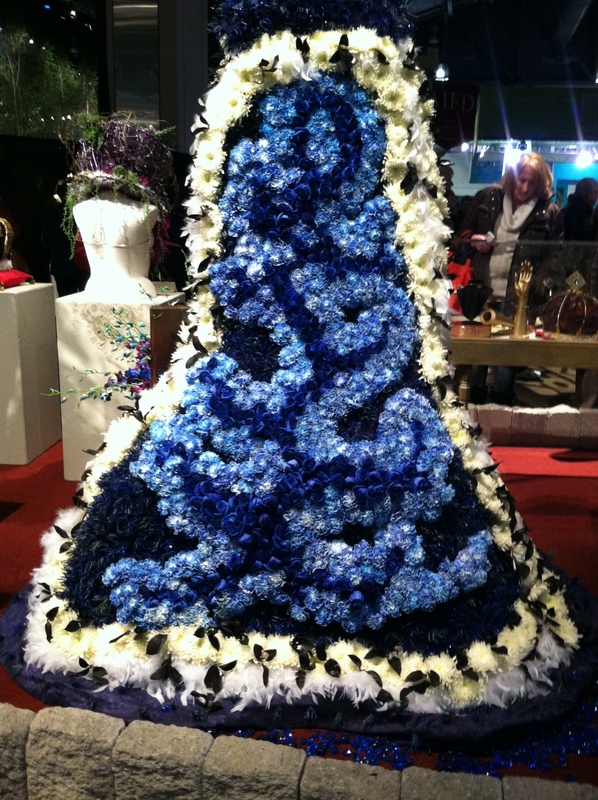 If you can’t make it this year to the show, you are missing a blooming ‘Brilliant’ show! English gardens were front and center with lots of English cottage style borders full of overflowing flowers. 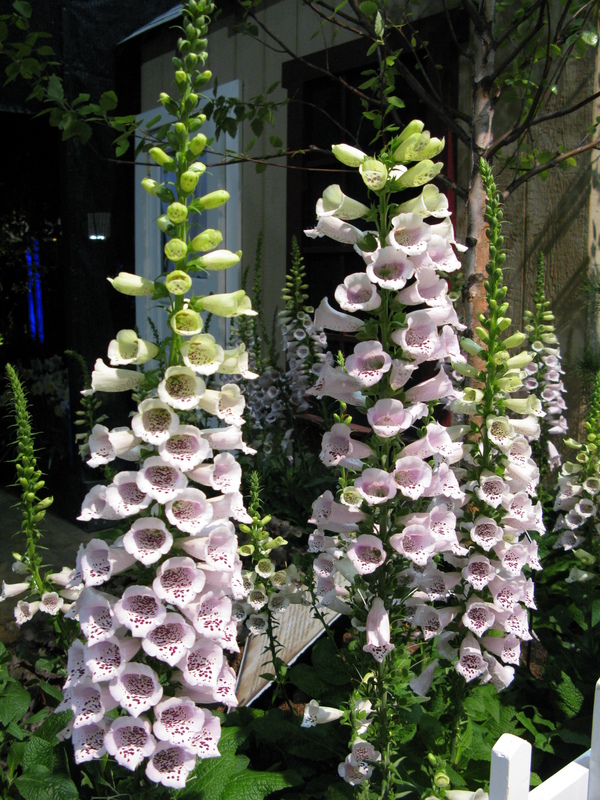 The flower that I noticed over and over were Foxgloves, a truly English flower. Peace Tree Nursery, who forces most of the plant material for the flower show must have had acres of Foxgloves to deliver for the show. They were beautiful! 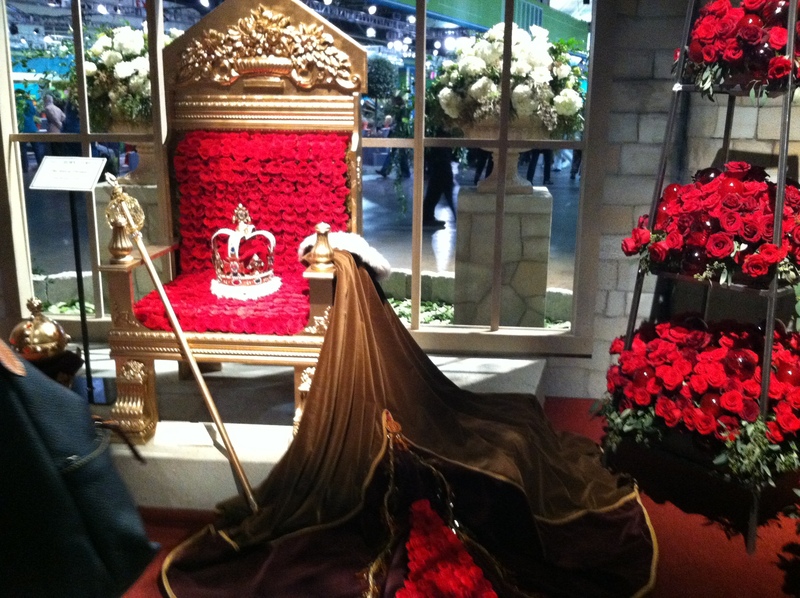 The Philadelphia Flower show is the largest of its kind in the nation and draws over 250,000 people from all over the world. 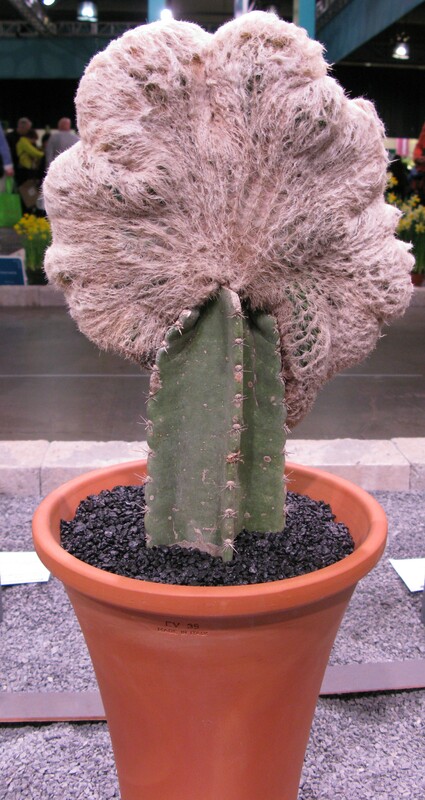 It is larger even than the renowned Chelsea Flower in England. Held at the Convention Center, the gardens cover more than 10 acres of floral fantasy. 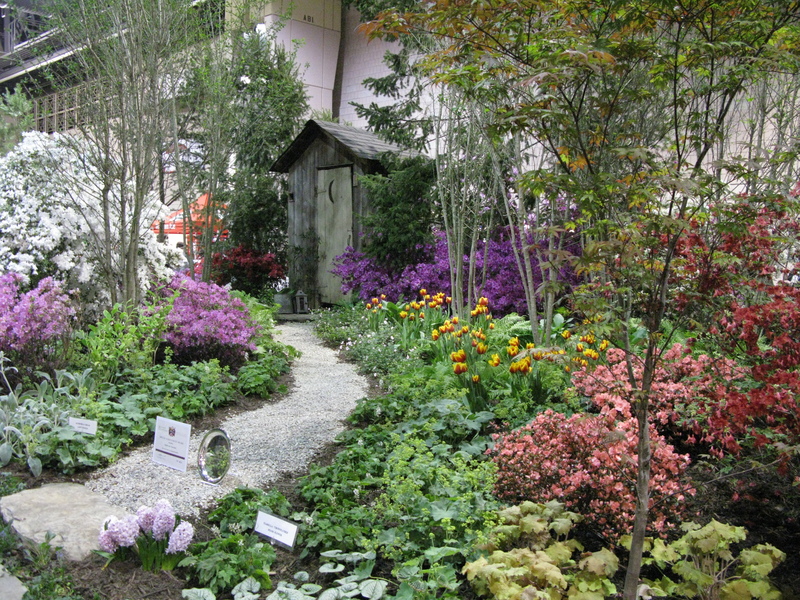 In addition to the major garden displays, the Flower Show hosts world-renowned competitions in horticulture and artistic arranging, hundreds of gardening lectures and demonstrations, special events, a mammoth indoor Marketplace, and a city-wide Flower Show Week celebration throughout downtown Philadelphia. 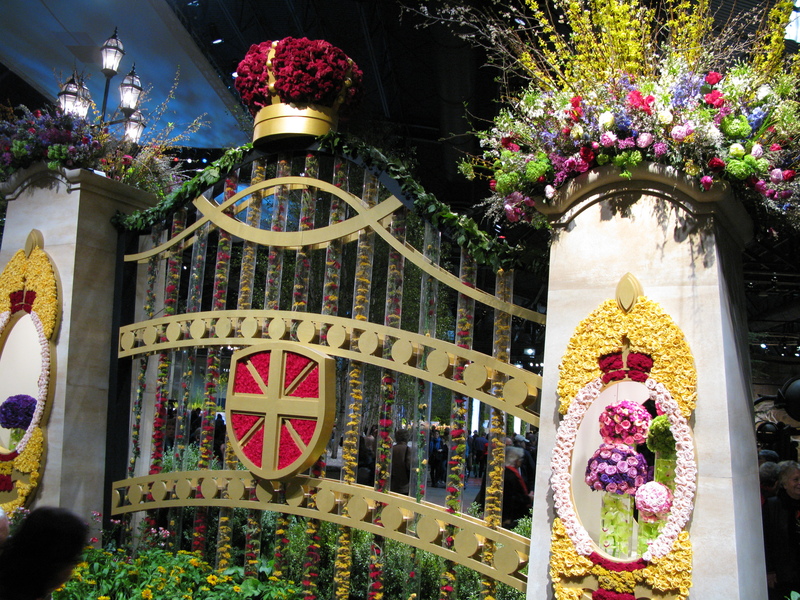 The Flower Show has been held since 1829, which makes it the oldest one in the nation. Brilliant! is this years theme and should delight all Anglophiles which I happen to be from traveling to Britain many times over the years. Only the English really understand gardening and make it a national “sport”. They also have the perfect climate to create those fabulous gardens that you see. 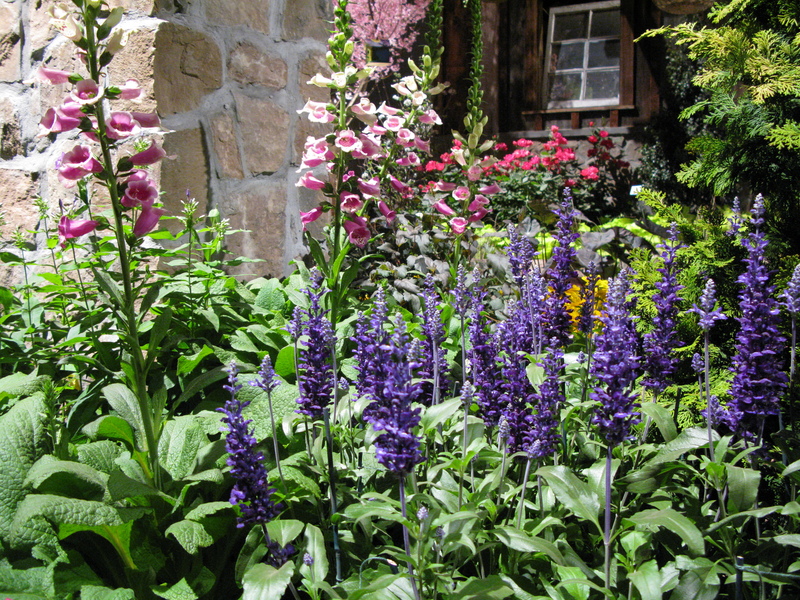 American gardeners are usually envious about the English “cottage” gardens and try to replicate them at home, but rarely succeed. We have a harsher, more unforgiving climate that takes tougher plants to survive. There is nothing wrong with that, it is just a different spin on gardening, and no less beautiful. I am a kid at heart, so the “Quest for the Queen” scavenger hunt really tickled my fancy. 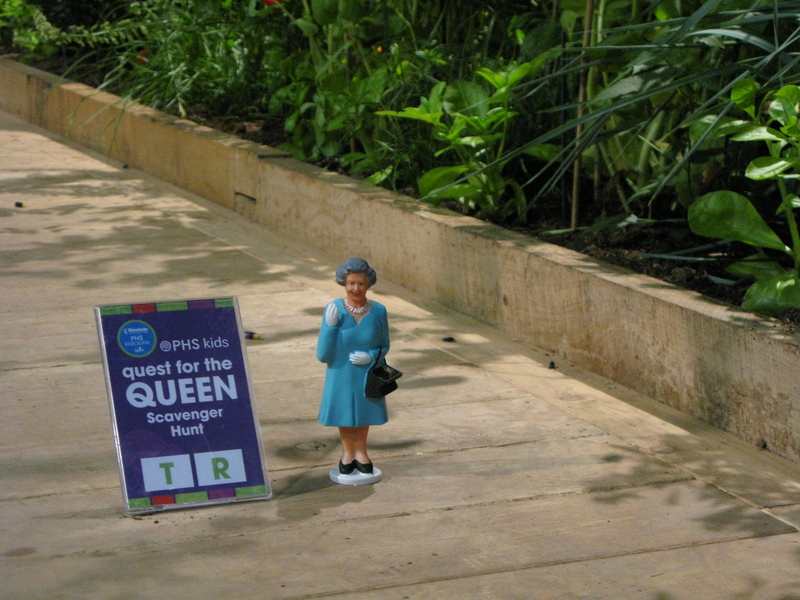 There were miniature sized “Queen” figures hidden around the exhibits and kids were challenged to find them. Make gardening fun for kids. I loved it! These are gardening newbies in the making! Ok, Maybe you have been living in a cave for the past year and haven’t heard about the latest craze of Fascinators! These were popularized at the last royal wedding when some over-the-top head-gear was displayed. New this year at the Philly Show, was the ‘Make and Take’ area for people to fork over $10 and make their very own interpretation of headgear that makes anyone stand out in a crowd. I saw dozens of them so this must have been a very popular feature. 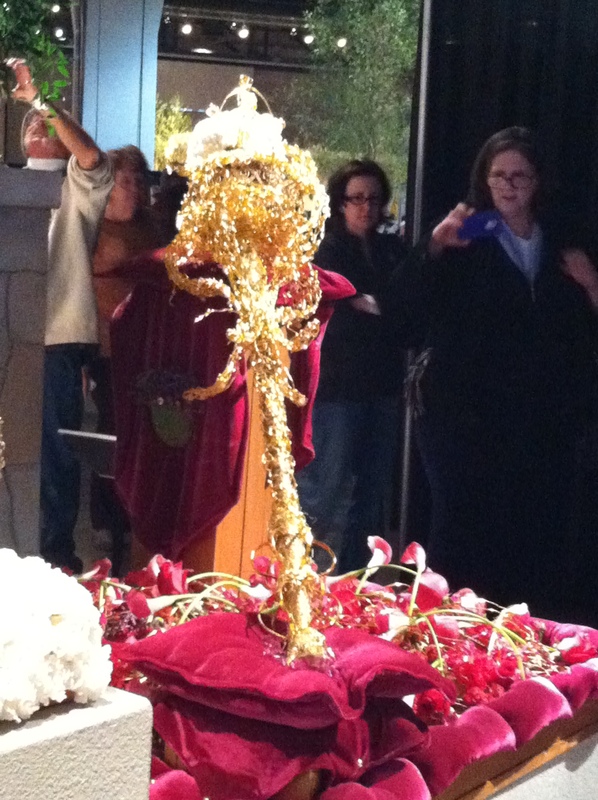 What if your assignment was to interpret the Crown Jewels in flowers? Where would you start? Color obviously, shape also, but glamour and impact are paramount! I think these designers accomplished that in spades! Crown Jewels – Sapphire Blue, This was my favorite! Ok, I agree that I am partial to this venue because I was one of the presenters! But, take a load off your sore feet after walking around for hours and listen to the different programs that the studio dishes up! David Culp on Hellebores, a container garden challenge, and creating a Bird Friendly garden, and myself doing a demo on Fairy Gardens were some of the different offerings on tap. 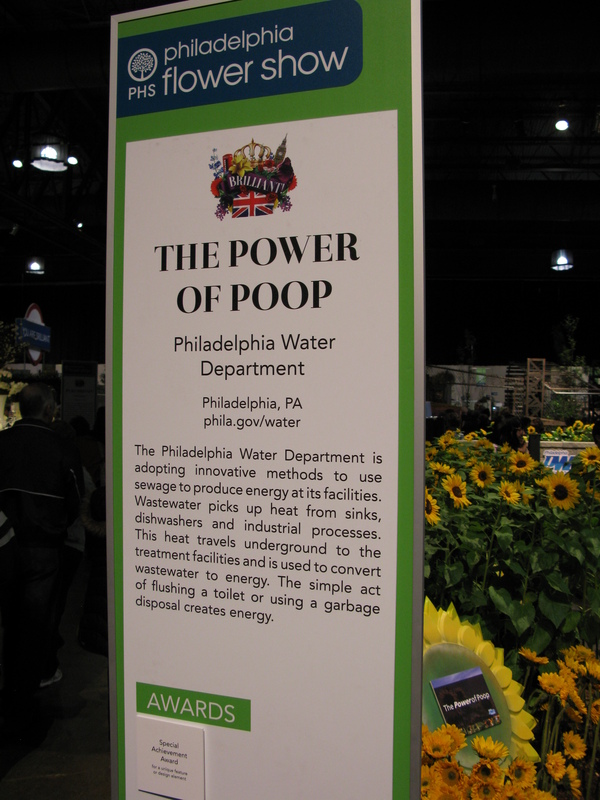 I did warn you that I am a kid at heart and I gravitated to this “Poop Exhibit” by the Philadelphia Water Department just like any kid would – the ultimate low cost natural fertilizer! 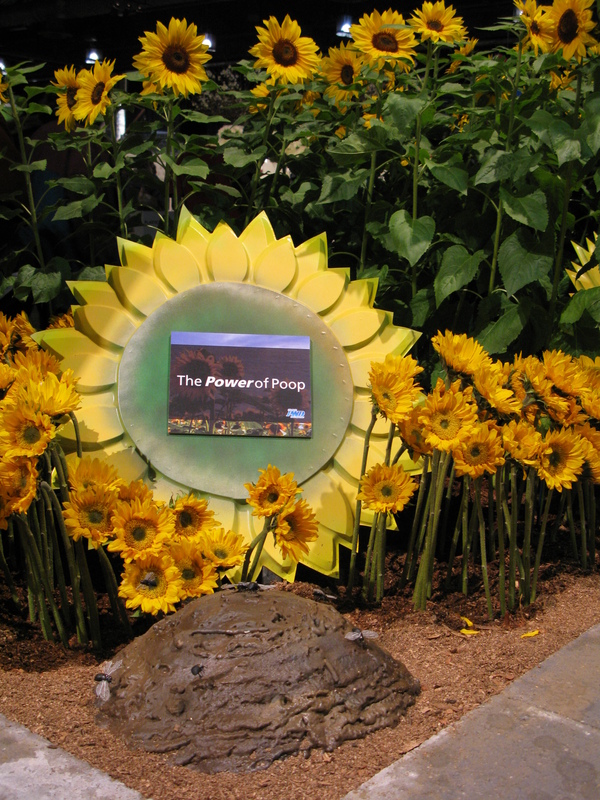 A fake pile of poop complete with flies! 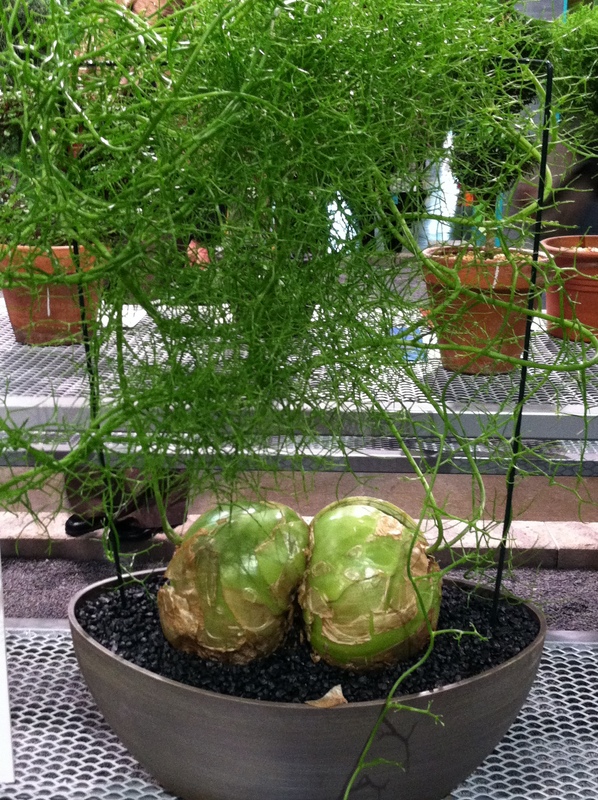 No show is complete without plant oddities and I spotted a couple. Check out these two. There is always a crowd gathered around the miniature gardens and I took lots of pictures of these. They seem to get better every year. Enjoy! Claire, I absolutely loved this issue of the Garden Diaries. 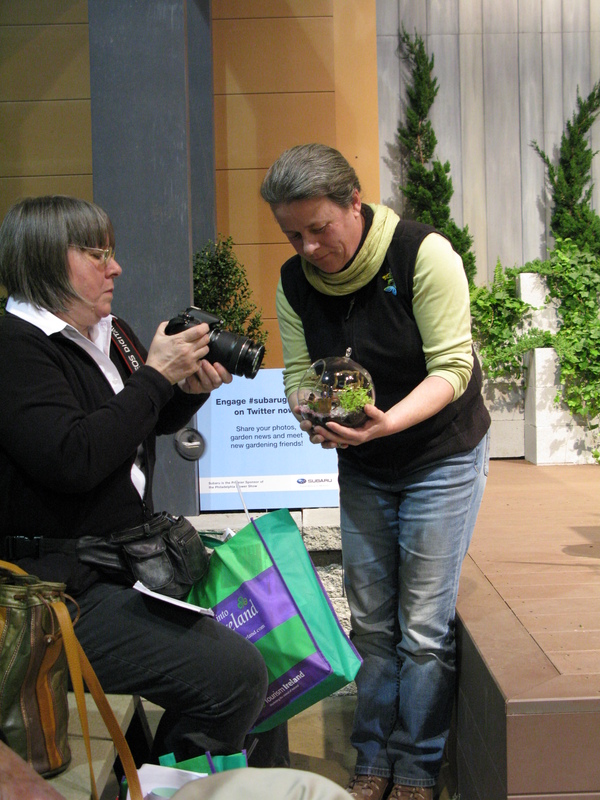 What a pleasure to see the pictures you took at the Philadelphia Flower Show! Especially since I could not get there this year! Thank you so very much for sharing your experiences. Also love the miniature gardens!